from Beyond the Great Wall: Recipes and Travels in the Other China, p. 67. My resolve to go meatless during the week crashed into this recipe like tank into a brick wall. 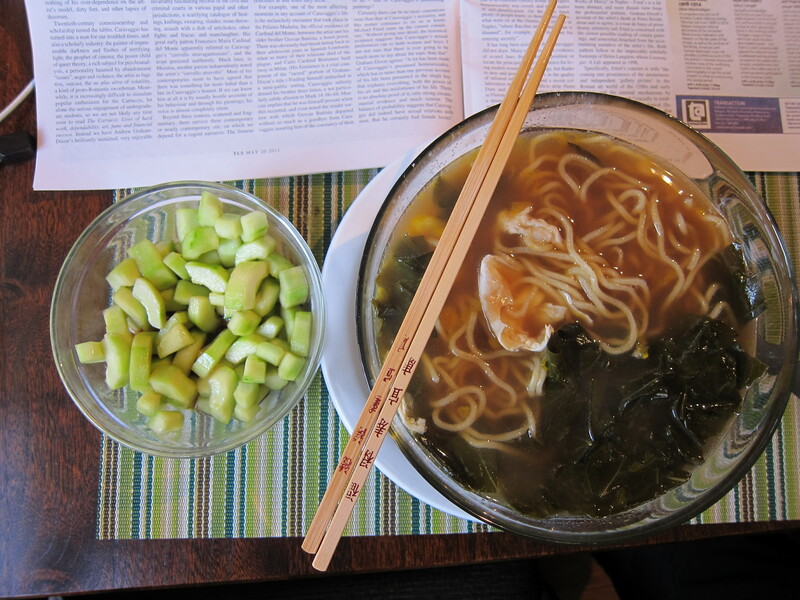 Oh, this recipe hit the spot. The crunch of the lettuce, the sweet and sour of the black vinegar-soy sauce, and the zing of the garlic-ginger-sesame oil notes combined beautifully. 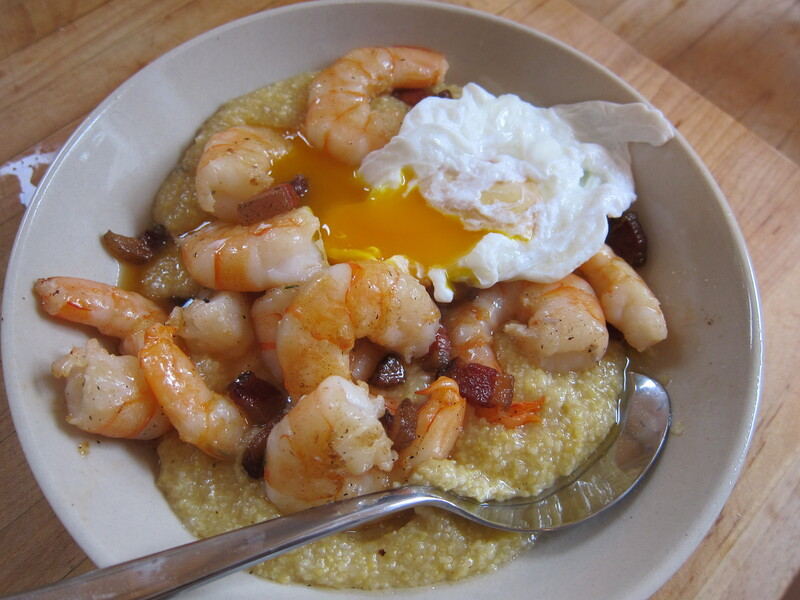 It’s a great recipe to throw together at the last moment for yourself. All you have to do is figure out your preferred ratio of lettuce to meat sauce. 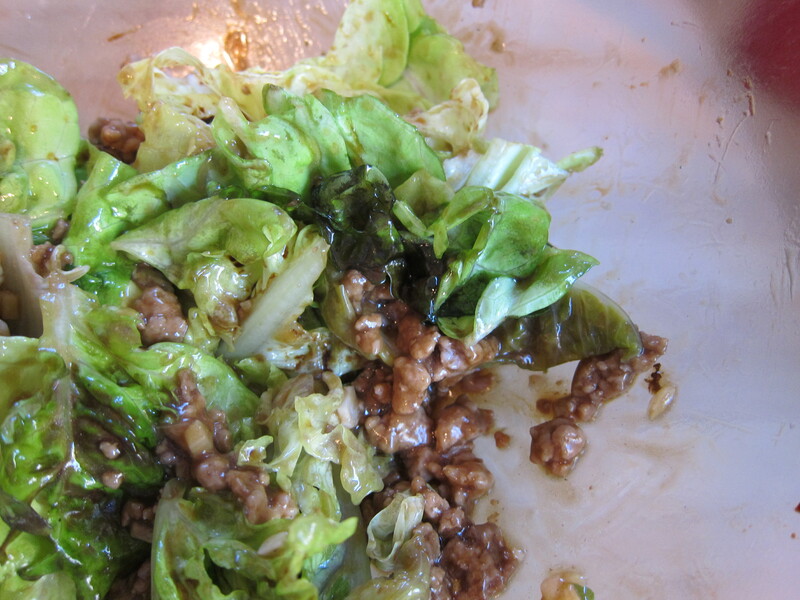 I urge you to consider 1/4 pound of the ground meat (half the amount that Alford and Duguid call for) with a bowlful of lettuce and the full proportion of sauce ingredients. You’ll find your own balance. This book just gets better and better. Shadowcook: I used a combination of lettuces. As the authors note, “If you use romaine lettuce, the salad will have good crunch as well as some wilted softer leaves when you first serve it. We love the contrast. If you prefer a softer texture, either let the salad stand for 5 minutes before serving it, to give the greens more time to soften in the warm dressing, or use leaf lettuced instead of romaine.” Or, like I said, use a combination and get it to the table while it’s still very warm. Shadowcook: I used 1/3 pound ground pork. Next time I’ll use a little less. And I’ll have to try it with beef, but I have a feeling I’m going to prefer the pork. Shadowcook: You can find this at any Asian market. Place the lettuce in a wide salad bowl or serving dish and set aside. Place a wok or heavy skillet over medium-high heat. When it is hot, add the oil and swirl to coat the bottom of the pan. Toss in the garlic and stir-fry for 10 seconds, then add the ginger. Stir-fry over medium-high to medium heat until slightly softened and starting to turn color. Add the meat and use your spatula to break it up so there are no lumps at all, then add the salt and stir-fry until most of the meat has changed color. Add the soy sauce and vinegar and stir to blend. Add the warm water and stir. While the dressing mixture is coming to a boil, place the cornstarch in a small cup or bowl and stir in the cold water to make a smooth paste. Once the liquid is bubbling in the pan, give the cornstarch mixture a final stir, add to the pan, and stir for about 1 minutes: the liquid will thicken and become smoother. Taste for salt, and add a little salt or soy sauce if you wish. Add the sesame oil and stir once, then pour onto the lettuce. Immediately toss the salad to expose all the greens to the hot dressing. Serve immediately.